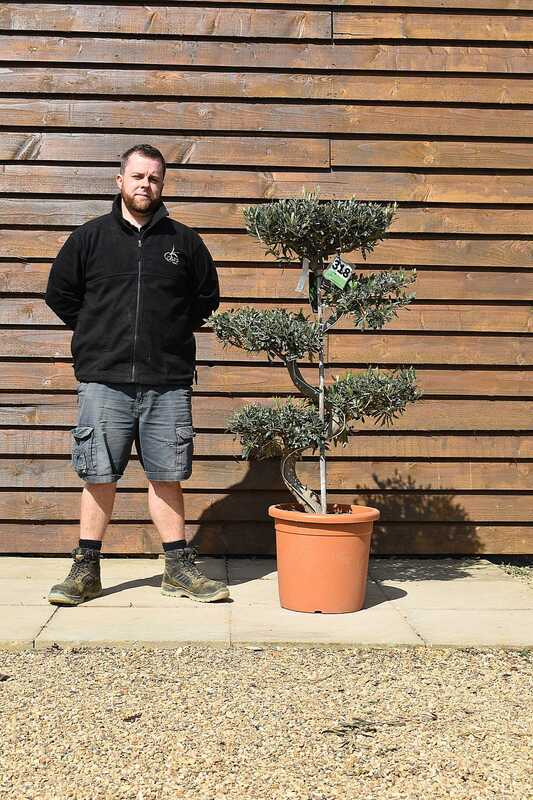 Cloud Olive tree a perfect little addition to any garden. These Standard cloud Olive Trees are often found in pairs outside front doors. These Standard cloud Olive Trees stand at approximately 4ft – 5ft and are the common cloud style. Our Olive Trees are of the highest quality and will flourish in and garden, providing they are in well drained soil and as much sunlight as possible. Olive Trees this size are incredibly heavy, so we advise you take care when choosing the placement of your olive tree. It will need as much sunlight as possible but a little shade is ok. Also, all Olive Trees (especially older olive trees) should be protected from wind. This is because although they are hardy down to approximately -10C, wind chill can be devastating as it can penetrate the bark. It then may be an idea to construct a planter around your tree rather than try and put in a new container or plant it – although if you can plant, ensure the soil is well drained. As this will require a dedicated delivery service, we will aim to place your as close to the final position as possible however, if you have special delivery requirements, please let us know and we will make arrangements for you. Olea Europaea have a multi branched habit are slow growing and very rugged. They can eventually grow anywhere between 4.5m to 9m tall, they have narrow oval leaves which are leathery, grey-green on top and silvery underneath. Very small white flowers are borne in the summer months, and it is possible for them to produce fruit in the UK climate if they have not surpassed their production age.